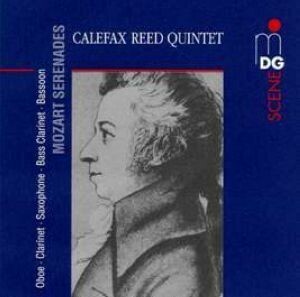 Mozart: Serenades | Calefax Reed Quintet | Dispeker Artists, Inc. When Mozart moved to Vienna, the Harmonie, which was a small wind ensemble, was very popular. He wrote his serenade KV 375 for a wind sextet, to be performed as an evening serenade. Calefax’s arrangement of the pieces relies mostly on Mozart’s own arrangement of it for string quintet. The 2 relativaly unknown adagios are a beautiful addition to this CD dedicated to Mozart.